I've had a lot of wonderful experiences in the eight months that I've lived in Maui. 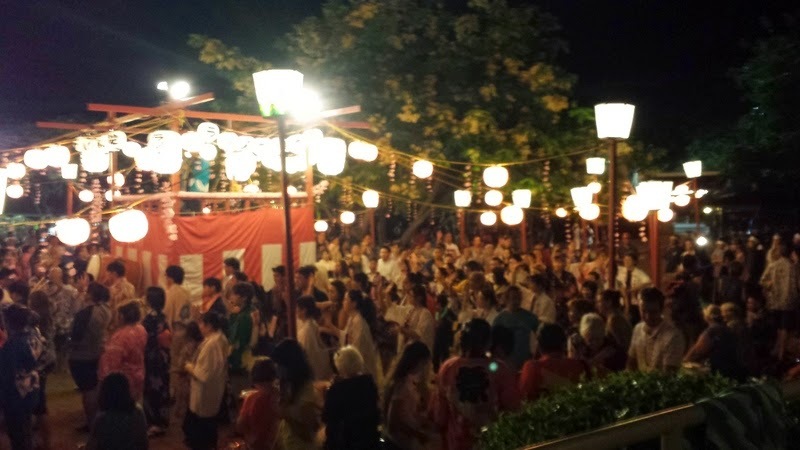 The Lahaina Obon Festival, on July 5, 2014, was definitely one of the best of my Maui experiences to date. The last time I had been to a Buddhist Temple was in Thailand. I've never seen a floating lantern ceremony (in fact, the animated movie Tangled, might be my only frame of reference, as silly as that sounds). I've never been to a Bon Dance. My manager was the one who said, "Jenni, you've got to go. And if you go, you have to jump in and dance." Well....she's been a witness to our spontaneous HR dance parties. She even supported the purchase of a small disco ball. So yes, I did jump in and dance. *and you can too - just follow what everyone else is doing! Obon is a Japanese Buddhist custom to honor the spirits of one's ancestors. What is a Bon Dance? Technically, it's the dance performed during the season of Obon. The story goes that a disciple of Buddha was using his powers to look at his mother, who had passed away. He discovered that she had fallen into the "realm of hungry ghosts" and was suffering. He went to the Buddha who gave him instruction to give an offering. As a part of this process, his mother's spirit was released. He also saw her true nature, giving and selfless. The disciple, happy because of his mother's release and grateful for what she had done, danced with joy. What will you find at a Bon Dance? I wish I had seen this Bon Dance 101 article before I went. It shows the different components of the dance. The centerpiece? The Yagura - the tower in the center that you dance around. This is the floating of lanterns. The festival this past weekend is the only one on Maui that does this - and it was so peaceful and beautiful. It's symbolic of the ancestors spirits returning to the world of the dead. If you have an opportunity to go to an Obon festival, go. You'll be glad you did. Click here for the 2014 Obon Festival schedule for all of the Hawaiian islands.